I am hoping that this is the last week for having great Granny up on the wall. All of the border units are pieced together and ready to be sewn to the main body of the quilt. There will be another plain charcoal border on the outside, and then I can declare this one done. Maybe this next week will see this one done, and I can cross off another UFO finished of the list of UFO's, except that I don't have a list of my UFO's. I'm afraid to go looking and actually count them. I don't really know how many of them there are, and I'm not sure I want to know. I'm just going to keep on working at them one at a time, while I resist the temptation to start something new. After this, I have to choose, do I work on the Thanksgiving leaves quilt, or on the Lazy Sunday Mystery. I think I have 6 or 7 of these leaves blocks finished now. I need 16 for the large quilt, or 12 for the smaller. Lazy Sunday still needs all its borders assembled. The individual pieces are all done and ready to be assembled into the borders. I have until Wednesday, when I'm going over to Gail's to sew for the evening to decide. Any opinions on which I should choose? I'm linking up to Judy's Design Wall Monday. Lots of lovely stuff to look at today. 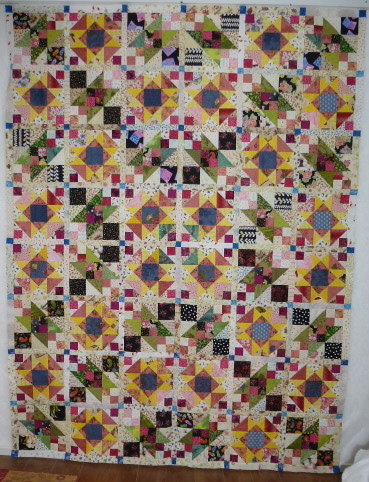 I've loaded one of Charlene's quilts today Its a really fun, very scrappy version of a Rail Fence. I'm using a simple diagonal quilting design to complement the horizontal and vertical lines of the piecing. And one of the best things about quilting for others is seeing all the different fun fabrics. Look at that spider web fabric down at the centre bottom of the picture. It's just so much fun. 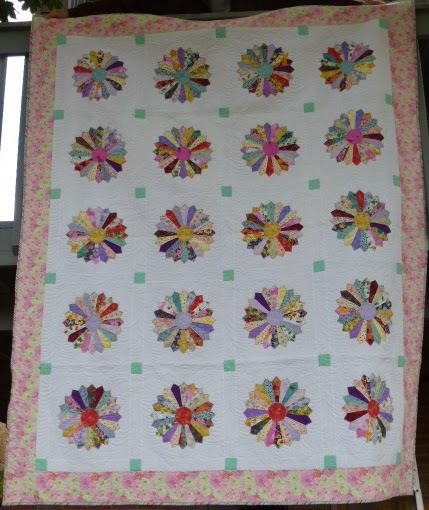 A couple of years ago, Bunny Hill Designs sponsored a Scrappy Dresden plate quilt along. I have always loved Dresden Plate quilts. It was actually the first quilt pattern I ever made, over 25 years ago, and I have made several more since. So when I saw this quilt along, I gladly joined in. As usual, it took me several years before I got it completely put together, quilted and bound. 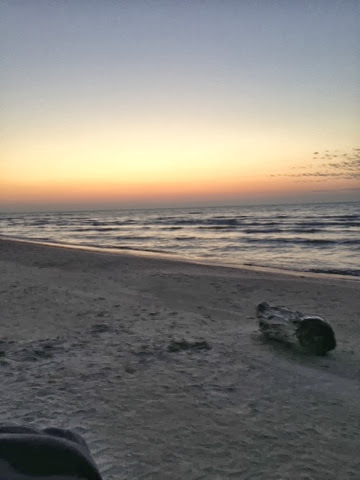 It was finally finished this year, in August, and I am thrilled with the way it turned out, and I'd like to share it with the blogging community. I love doing scrappy quilts. Sometimes I like them all helter skelter and anything goes, as long as no two like fabrics are touching. 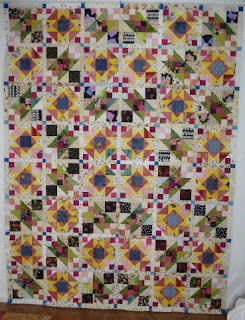 Sometimes, as in this quilt, I like the scrappy to be controlled with a constant background and some unifying elements. With this one, the plates went on a white background, and the aqua cornerstones and the pink border provided the unifying elements. I further unified the Dresden Plates by giving each horizontal row the same colour center, but continued with the scrappy with each row's colour being different. I quilted it, on my long arm machine, with an all over feather design in the white background areas. Inside each Dresden Plate, I quilted a modified continuous curve in the petals and a five petaled flower star shape into each center. 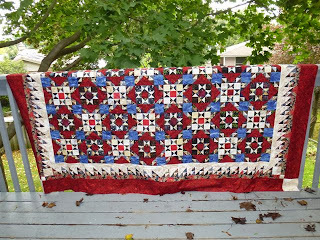 The border has feathered vines that flow continuously around the entire quilt. It is bound with a diagonally printed stripe, with a narrow faux piping fabric in the same aqua as the cornerstones. 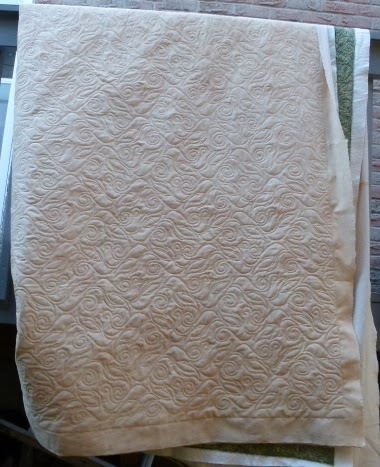 Here's a view of the backing, which shows a more detailed view of the quilting in the plates and the borders. I hope you have enjoyed looking at this quilt as much as I enjoyed making and sharing it. I'm linking up to Amy's Creative Side: Scrappy Quilts. I remember saying a while back that I kinda hoped that my balance numbers for this year would get below 50 yards added. Well, this week I hit that goal. Doing up backings and bindings sure puts a dent into those numbers. So, now I will wonder if I can get below 25 yards added before the end of the year. I'm not sure if I will hit that, though. I'm still trying to concentrate on getting some UFOs finished, and a lot of the fabrics in them have already been counted. Getting to zero is in no way even remotely realistic, I don't think. Especially since someone a couple of years ago came up with the wonderful idea of having vendors at our monthly guild meetings. No, seriously, it's a wonderful idea. However, the temptations are sometimes just too strong to resist. Balance: 46.7 more yards in than out. Today, I'm going to continue working on Great Granny. 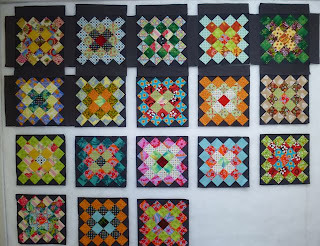 And I also want to see if I can get some photos done of the quilt I want to enter into the Bloggers Quilt Festival. I'm linking up to Judy's Stash Report. Our guild, the London Friendship Quilters' Guild, does place mats for Meals on Wheels every year at Christmas. Usually, the individual members make whatever pattern and colours they want, and bring them to the December meeting for labeling and delivery to Meals on Wheels. This year the program committee, on which I am serving this year, has issued a challenge to make the place mats a bit more interesting and fun to make. We purchased some cards from J. Lee Cards and Photograph, (unfortunately, she doesn't have a website), and then had the guild members who wished to participate draw a card from the bag, and then challenged them to make their place mats from the colours found in their cards. This picture to the right here is the card that I drew from the bag. And these are the fabrics that I have pulled that I think cover pretty much all the colours in the card. I have my design for the place mat all figured out. All I need to do is start cutting for it. All of us participating will bring our cards and finished place mats to the December meeting and display them together to have the fun of seeing how everyone interpreted the colours in their cards. And then the other day, Thursday I think, I got a text message from Gail asking if I had seen the block of the month being sponsored by Mad About Patchwork pictured here on the blog for the Mad About Patchwork store. I hadn't seen it, so I went to look at it. Big mistake, since I have now decided that I have to do it. And Gail wants to do it, so we'll work on it together. I loved it so much that I had to play with pulling some fabrics. This one to the right here is the starting point. And these are all the fabrics that I found that might work with it. It will be fined tuned some more before the final choices are made. And there are a couple more projects that have to be finished before I start anything new. Definitely the Great Granny Square quilt is going to be finished before starting this. The place mat has to be finished before starting this, and maybe the Thanksgiving Leaves will get finished as well. And, in order to stay with the intent to continue with finishing things before starting anything new, I'm now going to go sew some more on Great Granny. All of her border blocks are now finished, so I can get to work on putting her all together. Well, I just finished my second cup of coffee, and am now into my third, which means my brain is at least partially functioning. I thought I'd write this now, while I'm thinking about it, rather than leaving it until later, since I have a bad habit of leaving things until later, and then they never get done. I'm trying to correct that habit. Much as I want to continue knitting on my sweater for myself, it's that time of year to start knitting for others. I have all kinds of stuff I want to do, so I thought I'd better get started. So, this is the back of the sweater. It doesn't look too interesting, so far. I have 2 of these big balls of this green, and 2 more of them in red. I must have been thinking of Christmas knitting at the time, in the rather distant past, that I bought them. But they are good for kids sweaters that will get lots of wear and lots of washing. This has knitted up in the past 2 evenings while watching TV, so it shouldn't take too long to do. I'm doing the back first, and then the sleeves, before doing the front. Oh right, I forgot to say that this is the Truck Sweater that I found on Ravelry, which I'm doing for Avery. I might need to purchase some smaller balls of yarn for the graphic on the front of the sweater, but at least I can get the rest of it done ahead of those purchases. I have some scraps of other worsted weight yarns here, though, that might work. 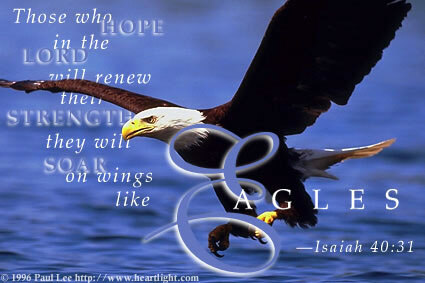 And thinking about it now, his Daddy has a white pick up truck, so maybe I can change the graphic to look like that. Hmmmm...... have to think about that. I'm linking up to Judy's On the Needles. And then I really need to get this day started. I'm going to do some more quilting on the Road to Brenham quilt, and I really hope that all the thread shredding issues I had yesterday, that I talked about here, don't continue today. I ended up having to switch cones of thread. After that, I got 1 1/2 passes done with no problems. 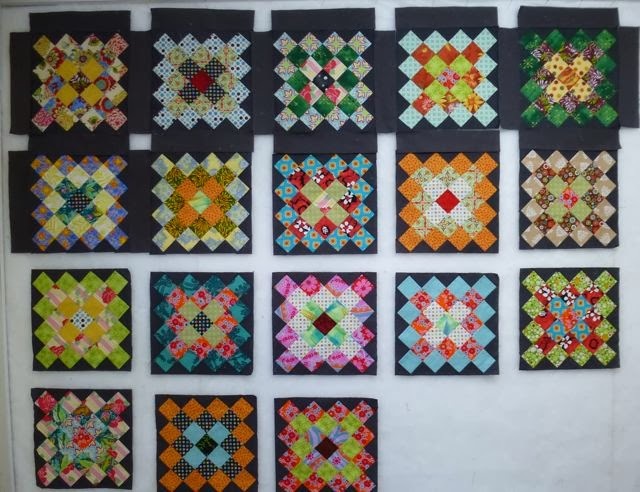 These quilts have been back with their owners for a couple of weeks now, but I'm just getting around to writing about them. This first quilt belongs to Amalia. She is a huge fan of batiks. I'm not sure I've ever done a quilt of hers that wasn't made of fun, bright colours. This is one of Bonnie Hunter's free patterns, Scrappy Trips Around the World. I used the Fossil Pantograph, by Lorien Quilting, and a very bright variegated thread. This next quilt belongs to Maureen. I used the Trellis Vine Pantograph by Threadsongs for this quilt. 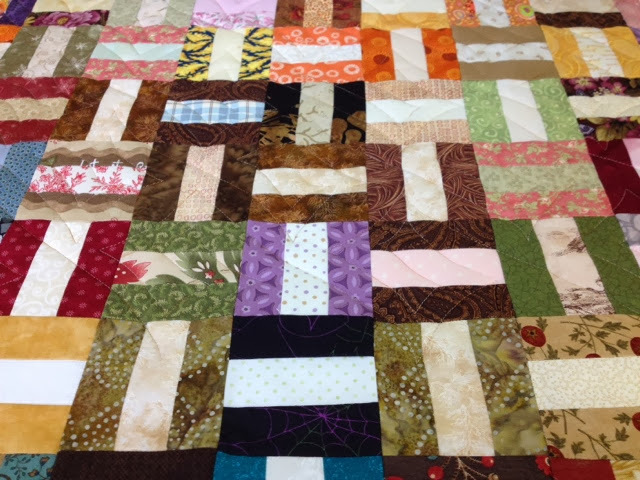 Maureen used a lovely collection of fabrics in this quilt. I don't know the name of it, but it had fun strawberries and strawberry vines and flowers on some of the fabrics. 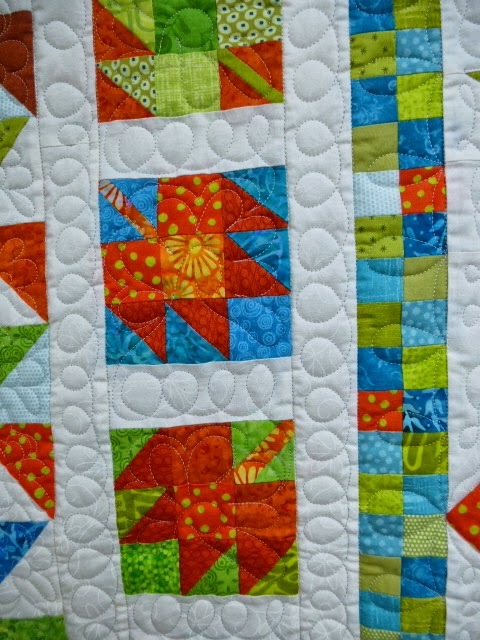 The leaves in the quilting design were quite similar in shape to the leaves in some of the fabrics. Here's a closer view of the top that shows the fabrics and the quilting a bit better. And a picture of the back. For some reason, I don't always take pictures of the backs of the quilts I do. I'll have to remember to do it more consistently. There is lots of lovely texture showing here on the back from the quilting. I've loaded on my Road to Brenham quilt and have just finished the third pass. I've been having some thread shredding issues which took some frustrating time and problem solving to fix. The last pass finished with no more shredding so I'm hoping it is fixed now. I want to get at least two more passes done today. It's a really detailed pantograph so each pass takes about twenty to thirty minutes, when there are no problems, which hasn't happened yet, and only covers six inches. Considering this quilt is 94 inches square 5 passes will take me to 30 percent finished. made a group quilt for Gwen Marsden, who is a very widely known and famous quilter. The three of these ladies have gone to Gwen's quilt retreats for quite a while now, although I'm not sure of the exact number of years. Gwen turned 80 this year, and decided that this would be the last of the retreats that she would host. So, in honour of Gwen, and to thank her for all she has done over the years, these 3 lovely ladies made Gwen a quilt, and brought it to me to quilt. Did I say already that this made me nervous? Not only would it be seen by Gwen, but by all the other ladies there. However, I knew about this while they were putting the finishing touches on the top, and had seen some pictures of it while they were working on it, so I was able to try and come up with ideas for it. me when I looked at the quilt was all the fun daisies in the fabrics. So I decided to take daisies as a theme in the quilting and run with it. I started out with half daisies in the flying geese, with a kind of vine like tendril coming off the side of the daisy to extend into the white background. There are also daisies quilted into the border, although they are hard to see in this picture. There are smaller daisies in the half square triangle border, as well. And keeping again with the daisy theme, they show up again in the maple leaves. 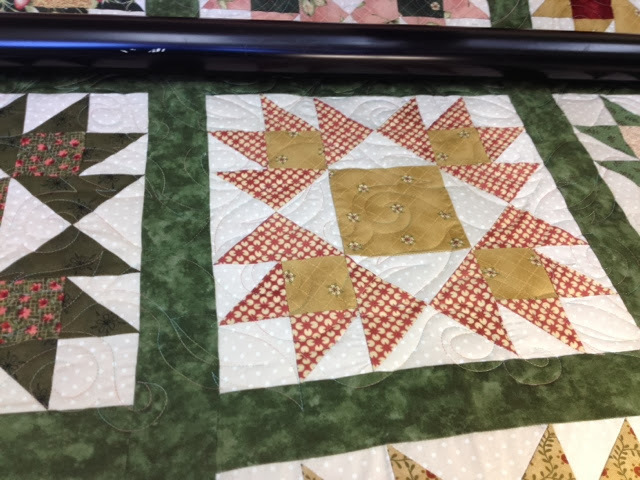 One of the biggest challenges in doing custom work like this, is coming up with a way for the quilting to be as continuous as possible, with the least amount of starts and stops as can be managed. In order to do that with the maple leaves, I connected them with the loops in the sashes between the blocks. And once the loops were there in the sashes, it was a natural extension to put loops into the borders. In the center of the quilt, the birds are stitched in the ditch, as are the orange borders and the basket. There is loopy meandering in the background of the birds as well as the daisy fabric around the basket. I put wavy lines in the basket, going in the opposite direction from the piecing, to give a hint of the idea that the basket was woven. The backing was a lovely soft and cuddly flannel, with leftover flying geese pieced down the middle. The quilting shows up really well on the back. The borders are easy to see on this picture. And this next one shows the center quilting. Once I got over my nerves, and sat down and listened to the quilt, followed by quite a lot of graph paper doodling, this quilt come together easily, and was an awful lot of fun to do, as well. Thanks, so much, ladies, for trusting me with this. Today was another long day spent in the kitchen. But I had some time to sew up a few more seams on the square in square in square blocks. I think I'm up to 50 of them, and I need 70. I just ran up to the studio, taking the short cut up through the house, and Matt and Becca's hall and through the garage. It's too wet and too dark to go the outside way I normally do. But I wanted to get a picture of Great Granny with some of her border units up with her. There is going to be some of the charcoal grey fabric between the quilt and the border to bring it to a size that the pieced border will fit. And if I have enough of the grey, there will be an outer border of it as well. Maybe tomorrow I'll get some more of the body of the quilt sewn together. in early September went over so well, that half of the jars are gone already, plus I sent a couple of the back with Noel when he went home to Sudbury after Thanksgiving weekend. So I bought some more makings, and ended up with 11 pint sized jars. Three of them are already upstairs with Matt and Becca. One thing about doing canning and cooking all day.... we certainly don't need the heat on down here. And that thing about heat rising... it definitely does. When I opened the basement door to come back down here from being up in the studio, there had to be a 10 degree difference. It was like walking into a wall. I've actually got the door open beside me, so that it can cool down a bit. Hot flashes and hot steamy kitchens, not a good combination. Ain't this time of life grand? Actually, I must say, other than the hot flashes, it is. I mentioned to Scott - who was a wonderful help with the salsa, by the way, he did all the chopping while I blanched the tomatoes - that this retirement, and being able to choose what to do and when is the most marvelous thing ever. 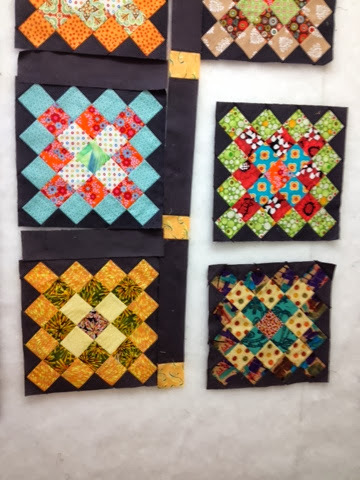 And, on that note, I think I will choose to link up with Judy's Design Wall Monday and then go sew on some more border units. Well, that took a bit more than just a minute, but here they are. I used a very simple quilting design on it, Square Spiral by Keryn Emmerson. 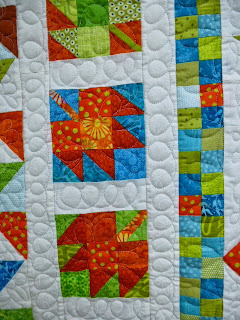 I liked the way the diagonal motion of the design picked up a lot of the diagonal lines in the quilt. All it needs now is the binding, which is cut and ready to be pieced, put on. Balance: 54.2 more yards in than out. I couldn't count the backing for Orca Bay here as fabric out, since it's off a large bolt of wide backing that I purchased for use for customers, if they wish to purchase it. I'm slowly starting to buy backings to have to offer, should a customer wish to have that option. I have a bolt of navy blue coming sometime this week, but I won't count that as in for my stash, either. I'm linking up to Judy's Stash Report, and then I think I'll do some more work on Great Granny. I'm still in finishing mode. Woohoo!! 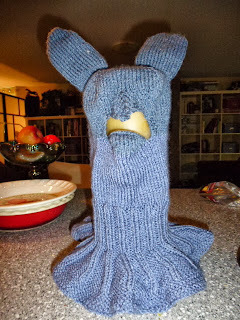 When Scott and I went out for our drive on Monday, I couldn't just sit and do nothing while in the car, so I finished up Avery's Bunny Balaclava. I'm pretty sure it will look a lot cuter on him than it does on my spaghetti container. But that was the only thing I could find that was tall enough to hold it up so I could get a picture. The nose section folds down, away from the nose and mouth, if it isn't cold enough for it, or if it turns out he doesn't like the stuff over his face. Then, since I have lots of this yarn left, I decided to start some mittens for him. These will be my take with me in the car project for the next little while, until they are done. And since I've gotten most of my knitted projects done, I started the Pinery sweater. It is knitted from the top down, and I'm loving the looks of the cables. It's worsted weight, so it's going fairly quickly. I'm not 100% happy with the way the neck is laying. There isn't any ribbing, or leading edge before the cables start, so the cast on stitches are really pulling. I might end up doing some kind of edge finish once it is done, but I'll have to wait and see how it looks once done and blocked. I spent a little time on Ravelry the other day... actually over an hour... ummmmmm, it might have been a little more than an hour....what a time gobbler that place is, but fun!. And I found a whole pile of fun little boy sweaters. I'm planning on going through my yarn stash, which actually isn't all that large, to see if I have yarn to do some of them. There's a Spiderman, and I know I have red yarn. There's one with a truck which would be perfect for Avery. He loves all things trucks. And then there's a dinosaur fair isle pattern. And I found the cutest owl sweater. There isn't enough time in one life to do all the quilts I want to do, let alone adding all the knitting I want to do. Somehow, I'm going to have to do some prioritizing........ any suggestions?? I'm linking up to Judy's On the Needles. We had our Thanksgiving celebration and dinner yesterday. This was our first holiday get together since we moved into our apartment here. It was a wonderful success. I can say with absolute conviction that it is a really good thing to have 2 full kitchens going in the same house for something like this. Two full stoves for the cooking and 2 full fridges to store the leftovers, which are, after all, one of the best parts of the whole thing, after seeing the family, of course. We've been here 6 months now, and I can say that it has been a successful transition, and I love living here. This year, more than ever, I am thankful for loving family. Our son, Noel, lives in Sudbury, which is a six hour drive from here. He drove down yesterday, after a stop in Wasaga Beach to see his son, Avery. Then, he left this afternoon to drive back to Sudbury, with another stop at Wasaga Beach to again see Avery. That's a lot of hours in his truck, but I'm so grateful that he came down. Winter is coming, sooner to Sudbury than for us, and long driving trips will be a lot harder to do then. Anyway.... on my design wall is Great Granny hanging around, waiting for some attention. She got a little bit of attention this past week, when her sashing was finished, but she's been kinda neglected since. I was planning on starting her pieced border this afternoon. But, it was such a lovely day out that Scott and I decided to go for a drive instead. The drive started out with the intent to go for a walk. But when we got the the place where we wanted to hike, it was edge to edge cars and people, who obviously had the same idea we did. So we settled for a drive in the country, instead, and then came home to wonderful turkey dinner leftovers. I'm thinking of going out this week sometime, and picking up some new speakers for my computer. Then I can put on netflicks up in my studio, and sew up there. I was used to having my own area for sewing, and I think that might be one of the 2 things I miss now that we are living here, the other being my lovely rose bush. I must confess to getting awfully tired of hockey and football, since I am not a fan of either. If I do that, there is a greater chance that Great Granny will get put together this week, or at least the main body of her will. I'm linking up to Judy's Design Wall Monday where there is tons and tons of inspirational and just plain fun stuff to see. First of all, happy Thanksgiving to all my Canadian friends. We have a houseful today, so it is going to be a wonderful time with family. Scott and I did up the turkey and dressing yesterday, and got it all prepared and into containers. All we have to do now, is put it in the oven an hour or so before we are going to eat. It has made today much less chaotic, for us at least. The young folk are going to be doing up the side dishes and veggies today. Personally, I think that's a good deal. I managed to get a lot of sewing done this past week. All the blocks for great Granny Square are now done, and the sashing is cut and almost all sewn together. And one of the rows is sewn together. That has made for a substantial stash reduction. However, I succumbed to the vendor at the guild meeting this past week, and bought some delicious lights. Since my stash is always short on those, I thought it a good addition. And that's my story, and I'm sticking to it. Balance: 56.1 more yards in than out. I'm linking up to Judy's Stash Report, and then I think I'm going to knit for the afternoon. I have an almost finished, so close that I can taste it Dreambird Shawl. I think I have enough of the main colour yarn to do one more repeat, and then another feather, and hopefully enough of the burgundy to finish off the edge of the next feather. And then it is done. Woohoo!! Maybe by the end of this weekend. I'm linking up to Judy's On the Needles and then I'm going back to knit some more. I finished the last two Great Granny squares last night. I was patting myself on the back and saying "good job". Then, I came up here today and added them to the rest of them on the wall. Well, all I can say of one of them is "yuck!" That one on the bottom right does not fit at all with the others. So I'll be making another one and the awful yucky one can maybe go on the back. I'm working on one of Maureen's quilts. It's a lovely traditional block. I had thought it a weather vane block until I checked for what that block looks like. It's similar to this. All that to say I don't know the name of this block. Whatever its name, I love the colours and fabrics that she's used. 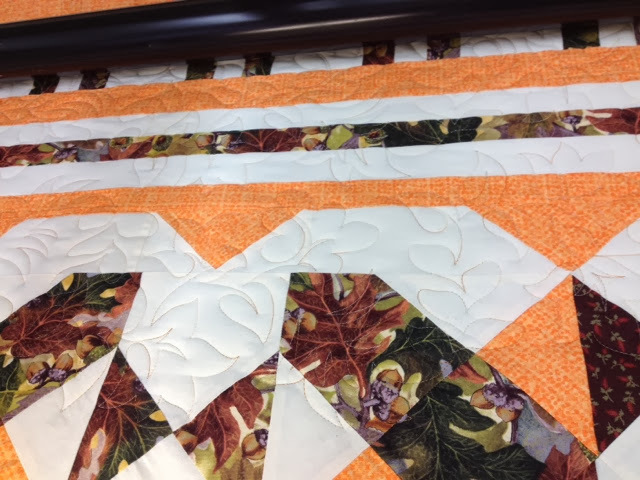 It is being quilted with a Trellis Vine pantograph by Threadsongs. I still haven't adjusted to this whole October thing. The summer just flew past, and I think I missed it. It's even harder to believe that this coming weekend is the Canadian Thanksgiving! There will be turkey and stuffing and pies and all kinds of other good stuff cooking around here, probably on Saturday. We want to go to church on Sunday, something we haven't done in a large number of years. It was just too difficult trying to work 3-11, with all the body clock issues that in turn created. But, I've been retired for almost 3 months now, so the body clock is slowly readjusting itself. So, if we do most of the cooking on Saturday, there won't be the frantic rush to get home and get everything in the oven. We'll get the meat off the turkey, and package it into aluminum foil and then all we'll have to do is throw it in the oven to heat up on Sunday. Noel will be here, too, which will be wonderful. I have my Great Granny Squares up on the wall today. I want it to be 4 blocks wide by 5 long, so I need to do 2 more blocks, and then that part of it is done. I'm going to be putting coloured corner stones at the intersections of the sashing, and probably a pieced border of some sort, not quite yet decided. And here is Orca Bay, all finished and ready to go into the fast track lane for my projects to be quilted. 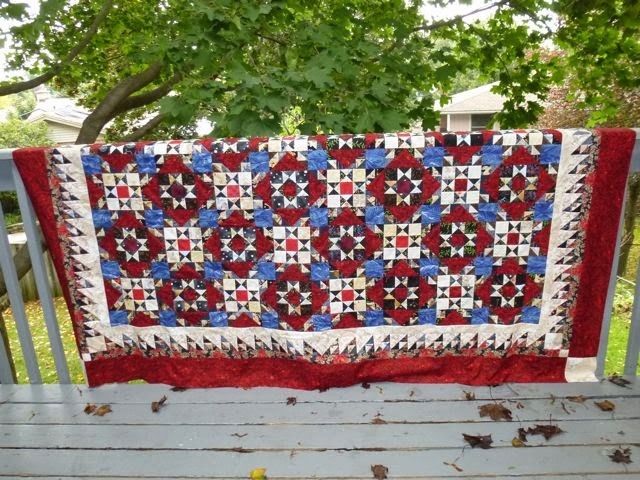 I have this one, and one other, also a full sized quilt, that need to be done before the beginning of December. I'd better get some more work order forms printed out, and get them into the line up. I'm linking up to Judy's Design Wall Monday. Then I think I'll go back up to the studio and work for another hour, and then maybe get the last 2 GGS's done. Not much usage this past week, since we were away for part of the week taking advantage of the beautiful fall weather we were having. I did some sewing while we were out in the woods, but it had already been counted. The only new usage this week was .5 yards for borders for Orca Bay. However, this week is already looking much better, and it only started today. The good news is that there was nothing added this week, which makes 4 weeks in a row without any fabric purchases. I'm not saying there won't be any more added this year, though. Balance: 58.6 more yards in than out. It has been a perfect day today. Bright and sunny and warm, and barely a cloud in the shy. 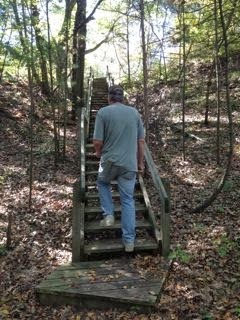 We decided it was a perfect day to explore one of the many trails in the park. This one was fairly close to our campsite, so we were able to walk over to the trail, rather than having to get into the car. There are a lot of sand dunes here, which means a lot of stairs and boardwalks. I always seem to end up only getting pictures of Scott's back whenever we go out. It probably has something to do with his 6'2" compared to my 5'1". I usually have a hard time keeping up with him, so he frequently ends up in front of me. 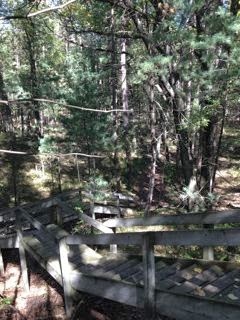 There were mostly pine and acorn trees on this trail. The post with the information about the trail says that the black oak trees that grow here, are normally found in the Carolina's, but because of the ecology of these dunes, they grow well here at the Pinery. After we got back from our walk, I had fully planned on setting up my sewing machine outside, in some shade, and sewing to my hearts content. However, the yellow jacket wasps had other plans for me. Those things are nasty, and there are tons of them and man are they persistent and aggressive. So my outdoor sewing plans got changed to indoor by the big window where I could see out, but they couldn't get in. I got 8 leaf blocks sewn this afternoon, and I might start putting them together later this evening. sunset, and it did not disappoint. Glorious, just glorious. 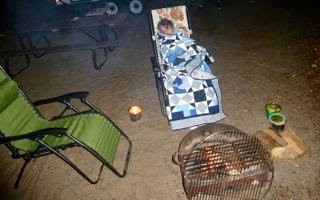 Then, after the sunset, we came back for a bit of a campfire and some star gazing. 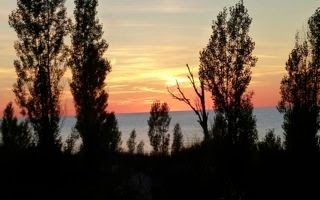 There are bonuses to camping at this time of year. Star gazing can happen much earlier in this evening, like at about 9 pm instead of 11. However, it is good to come prepared for the cooler temperatures. Being a quilter has its advantages when it is chilly out by the fire, and something warm to wrap up in is required. My wonderful husband just had to get this picture of me all snuggled up in front of the fire. It looks like bright daylight, but that's just because of the flash. The cooler temperature ended up chasing us inside, which gave me the time to sit and write this. Scott's sitting at his computer playing a railways game, and my sewing machine is there, waiting for me to come and play. Here we are at the Pinery, day one and first sunset we've actually seen all year. It's so strange to think that it's the first of October. It's actually warmer now than it was back in august. It's gorgeous and I am enjoying every minute of it. I'll post this and then go join my husband.